Vitamin C science project uses titration method to compare vitamin C concentration in different substances. In the end of this article you'll find some ideas for vitamin C science projects which you can do using this method. Vitamin C is essential nutrient. A person needs at least 40mg vitamin C daily. The lack of vitamin C in the body can cause weak immunity, and even scurvy. It is important to know how much vitamin C is in the food we eat. Fresh fruits and vegetables are the main source of vitamin C, but how to find out if we are having enough? There is a simple method to determine the amount of vitamin C in juices and other drinks. Using this method you can make a variety of different chemistry science projects. It's well known that Iodine reacts with many substances as it is very powerful oxidant. 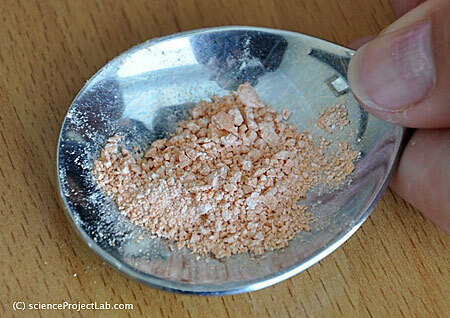 In the mixture of many different substances it first reacts with molecules that easier to break down. Vitamin C is anti-oxidant and will react with Iodine promptly. If we mix vitamin C and starch and will gradually add iodine into this mixture, iodine will only react with vitamin C, ignoring starch. When mixture ran out of vitamin C Iodine will react with starch. This reaction has very distinctive dark blue color output. 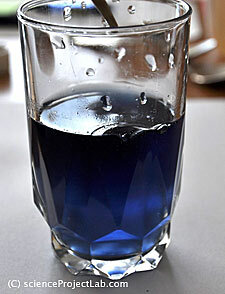 As soon as all the vitamin C reacts with iodine next drop of iodine will react with starch and turn the mixture into dark blue. Starch here acts as an indicator, which shows us that all the vitamin C has reacted with iodine. Thus we can find out the exact amount of iodine needed to react with vitamin C. Knowing that we can calculate amount of vitamin C in the mixture.This method is known as titration of vitamin C with iodine in presence of starch, as indicator. All you need for Vitamin C titration: Iodine solution, Tablet of Vitamin C, eye dropper, water, couple of glasses and starch. 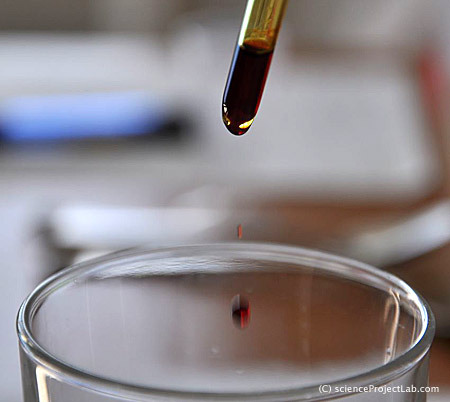 To find the amount of vitamin C in a sample we need to know how many drops of iodine solution needed to react with known amount of vitamin C. For this we'll prepare 1mg/ml solution of vitamin C.
Take a big glass jar and fill it up with 500 ml of water. Crush one (500mg) or two (250 mg) tablet of vitamin C and put it in the jar, stir it well, until vitamin C tablet dissolves. 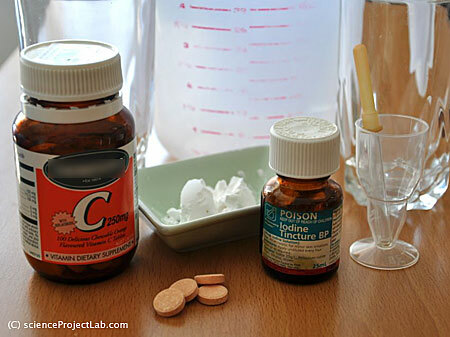 This way you'll get 1 mg/ml solution of vitamin C.
Measure 20 ml of that solution, bring it to another glass and add about half glass of water. This glass will contain 20 mg of vitamin C.
Two crushed 500mg vitamin C tablets. Now prepare starch solution. Dissolve 1 teaspoon of starch in small amount of cold water (1-2 tablespoons) and bring it into a half glass of boiling-hot water. Stir it well, until starch dissolves and let it cool. 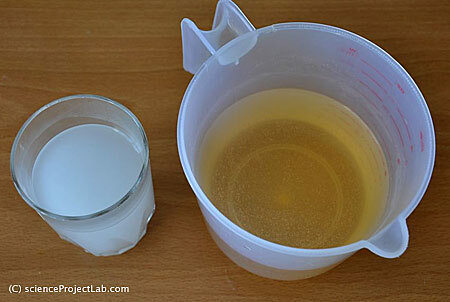 Take 1 teaspoon of starch solution and add to the glass with 20 mg of vitamin C.
Starch solution and 1mg/ml Vitamin C solutions are ready to use. With an eye dropper take some iodine solution and slowly, drop by drop start adding it into vitamin C and starch mixture, counting drops. Stir the mixture well at the same time. Add Iodine one drop at a time and stir solution well. 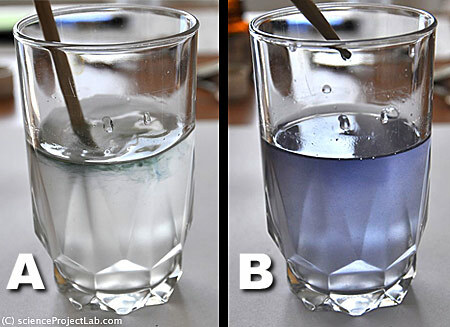 As soon as Iodine will oxidize all the vitamin C in solution, it begins to react with starch and the mixture will turn dark blue. Write down how many drops of Iodine solution needed to change the color of the mixture. Stir the mixture and make sure that color is stable. The number of drops of Iodine solution you've got is very important data. It will allow you to measure the amount of vitamin C in any other mixture (if you use the same Iodine solution and the same eye dropper). On the images below we show the stages of titration process. In the beginning the solution is rich with vitamin C. You can see that color reaction starts to happen around the droplet of Iodine, but it quickly disappear as Vitamin C "takes over" (A). Later when Vitamin C has almost gone pale blue color spreads in the whole volume of solution and disappears slowly. This is the sign that titration is almost complete! Titration process at the beginning and almost at the end. You will know when titration is complete. The solution will turn very rich dark blue color and will not change during next few minutes. The Mission Complete. The dark blue color of solution tells us that all the Vitamin C has gone. Now when we know the amount of Iodine solution needed for 20 mg of Vitamin C. we can find Vitamin C concentrations in other solutions. It's important to use the same eye dropper and same Iodine solution. You should take the same volume of the sample solution - 20 ml to simplify calculations. Put sample in a glass and add water and starch as we described above, titration process is the same. Sample mg/ml = Drops Used Per Sample/Drops Used For 1mg/ml Solution. 12 drops of Iodine used to oxidize Vitamin C in 20 ml of Cranberry Juice. 44 drops of Iodine used to oxidize Vitamin C in 1 mg/ml solution. So we found that we have 0.272mg of Vitamin C per ml of the juice. Note that if you decide to repeat this experiment you can not use our numbers due ton the possible variety in eyedropper diameters and therefore volume of iodine drops as well as differences in Iodine concentrations in the bottle. Measure Vitamin C concentration in different juices from the grocery store, compare the results with concentrations indicated on the juice labels. Measure concentration of vitamin C in different fruits. Is there a difference between fresh fruit juice and juice from supermarket? Study natural depletion of Vitamin C. How fast oxygen from atmosphere oxidize Vitamin C? Study natural depletion of vitamin C: how fast vitamin C degrade in boiling water?